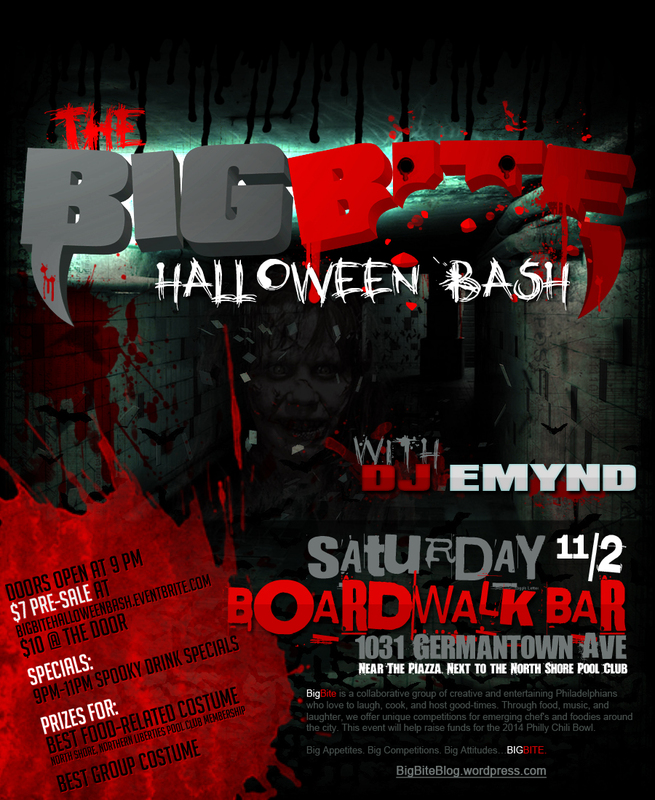 BigBite Philly’s HALLOWEEN BASH – Nov 2nd! Join the BigBite Philly team as we celebrate our favorite holiday – HALLOWEEN – on Saturday, Nov 2nd at Boardwalk Bar (next to North Shore) in Northern Liberties. Help us raise funds for the 2014 Philly Chili Bowl! Dance your face paint away with tunes by DJ Emynd, and make sure your costume is not too tight for the midnight Ghoul Train Line. Doors open at 9 PM and spooky Stoli Vodka drink specials will flow from 9-11 PM! Get there early! Prizes for best food-related costume (a North Shore BeachClub membership) and for best group costume! TICKETS: $7 Pre-Sale. $10 at the door. BUY TICKETS! *Proceeds of this event will go towards the Philly Chili Bowl 2014!! Help us create an even bigger event!! Don’t be scared…it’ll be a ghoul’o time! This entry was posted on Tuesday, October 22nd, 2013 at 10:57 am	and posted in DJ, Food & Dance. You can follow any responses to this entry through the RSS 2.0 feed. Sign for Enterprise carshare tonight while your waiting in line and your first drink is on us and you also a free $15 dollars in driving credits .